OK so I've always been a traditional Coleman fan, especially of the old white gas/naptha stoves. The pyromaniac in me is tickled by the prospect of carrying a little green bomb/explosive device/briefcase legally, but I digress. 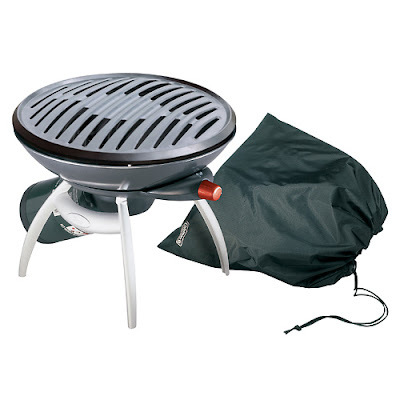 Anyway, in the never-ending quest for miniaturization I have been eying the RoadTrip Party Grill. I am sure I have seen them locally, but was not able to find one. then I noticed that they appeared on Coleman's U.S. website, but not on their Canadian one...strange. Not sure why that is...safety concern?? Not likely since the ridiculous Coleman propane Deep Fryer is there for the taking (note to self: increase Lipitor dosage accordingly). Really though...that's all we need on our next camping trip; a propane deep fryer.